Dinosaurs for kids have always been a source of interest . Maybe it's due to the scary nature of these huge beasts that although bigger and fiercer than anything they have seen or will see, they know for sure that they won't bump into them at summer camp! This gives them the freedom of imagination. A bit like giants or witches in fairy stories. But whatever the reason it makes for a great theme to do with your class whatever age they are. 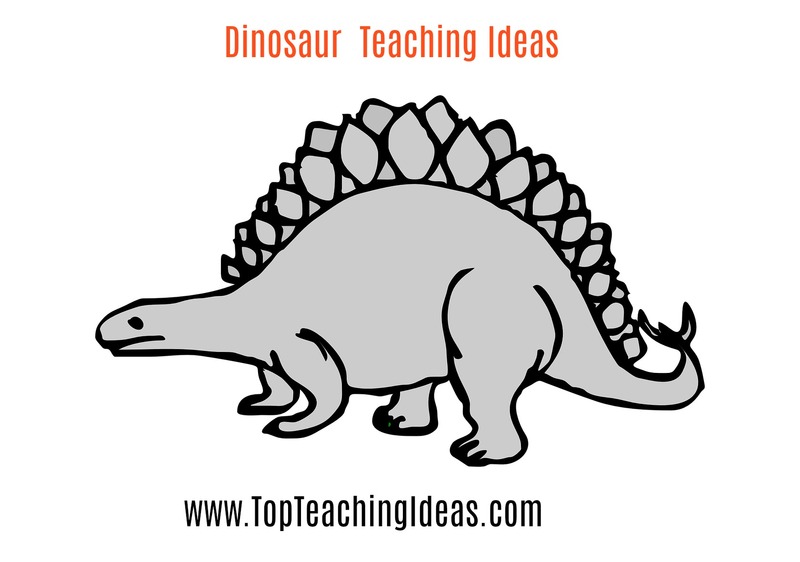 This dinosaur for kids theme offers a huge variety of teaching ideas for all areas of the curriculum. So scroll down and get started! Let the dinosaur theme begin! There are some worksheets for you to use too. Begin your dinosaurs for kids theme by 'brainstorming' what they already know about dinosaurs and writing these facts down on a whiteboard or large piece of paper. The word dinosaur means 'terrible lizard'. Dinosaurs are extinct. That means they don't exist anymore. Some dinosaurs just eat plants. They are called herbivores. Some eat meat and these are called carnivores. 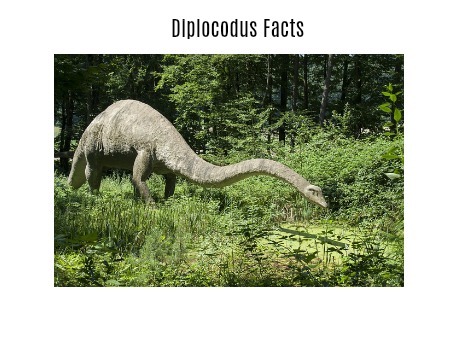 Some dinosaurs are very big such as the Diplodocus and some are very small like the Compsognathus. This big dino was alleged to have lived in western North America. He was the longest dinosaur at 35m in length until the fossilised bones of an even longer one was found in Argentina and measured in at 40m. His long neck helped him reach leaves at the very top of the trees. 1 Once you have collected all the facts together challenge the kids to choose their favourite dino and write a FACT BOOK of their own. Allow them to research the information on the internet and have a collection of non fiction books on hand for them to use. 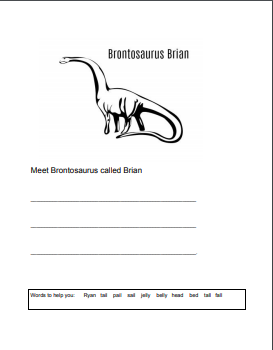 www.Kids-dinosaurs.com with printable mini books here. 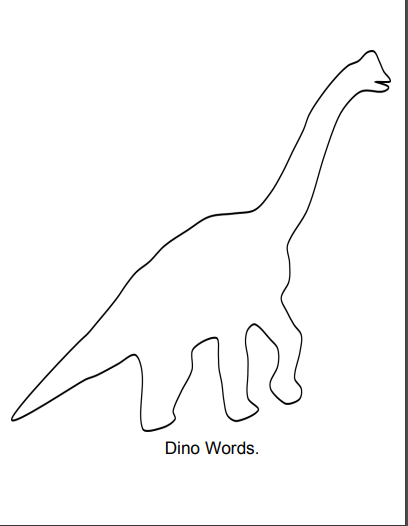 Print off enough outlines of dinosaurs for each child to have one and ask them to write down as many 'Dino words' as they can inside the print-off.You could learn the 'dinosaur stomp' song to get them in the mood! You might like to introduce this dinosaurs for kids teaching idea by having a few goes at it before you let them loose on the idea. 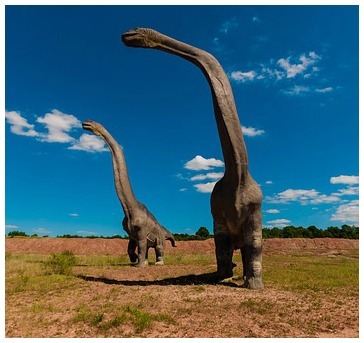 Start by giving them an example such as Diplodocus is 'as big as a bus'. Then get the kids to think of some of their own. You could make a class book of Dino Similes, one for each dinosaur perhaps? Encourage the kids to make some silly ones because silly ones are more fun! Read the poem 'Wayne the Stegosaurus' from the book 'The Biggest Burp Ever' by Kenn Nesbitt with the kids and challenge them to change the words to create their own version of the poem. I have included a worksheet for you to use with examples of words they might like to incorporate! Share some dinosaur jokes with your class and then ask them to make up some of their own. Here are a few to start them off. What do you get when a dinosaur walks through a strawberry patch? Answer: Strawberry jam! What is T Rex's favourite number? Answer: Eight! What do you call a blind dinosaur? Answer: I-don't-think-he-saw-us! Make a class book of Dinosaur Jokes with all the best ones in! 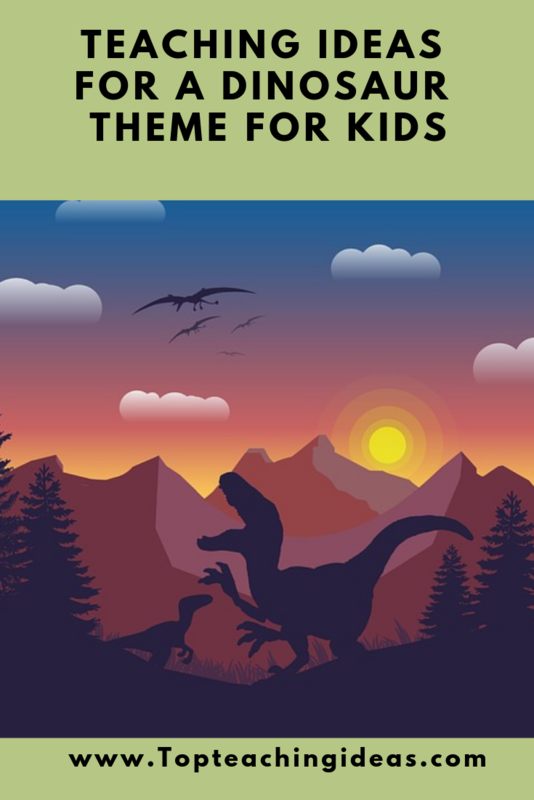 A great addition to your Dinosaurs for kids theme! This is a great way to get the kids sparked up. The following films are just a few of a huge number you can choose from. 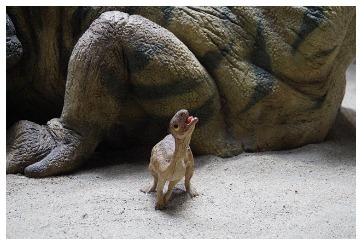 Imagine you had found a baby dino. You knew it would die without its mum so you take it home and look after it. Sssh don't tell mum! What would you feed it on? Where would it live ? Would you have to make a cage or a shelter for it? Would it need to be taken for a walk? Could you train it to do tricks? Write a short account or diary extracts to answer all the above and more if you like. Don't forget to add some pictures too and give your pet dino a name! 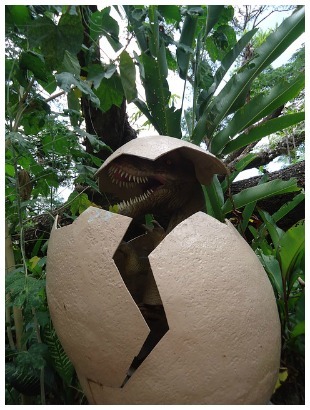 Alternatively you can build up the tension by telling the class that you found a dinosaur egg in the school grounds[ making a real one would be good if you have the time] then asking them what they should do with it if it hatches? What kind of dinosaur it might be and how did the egg got there in the first place.Then suggesting you keep him in the class as a school pet! But hey, how are we going to look after him? I guarantee that the end product will be a lot better if you build up the 'let's pretend' factor before you start the writing. 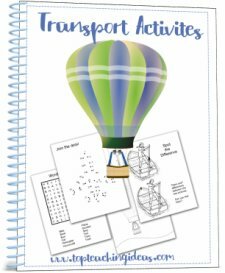 You can find a nice little worksheet to go with this activity from homeschool-activities (about half way down the page). Just a few of the many dinosaur books you can get for your dinosaurs for kids theme. 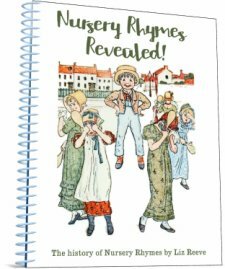 Most of them you can get on 'Amazon' which allows you to have a peep at part of the book before you 'click and buy! Dinosaurs are BIG! So your first dinosaurs for kids math activity is to do a 'Scaling down' task with the kids so they can draw their favourite dino to scale! You will need pieces of A4 squared paper, rules. pencils and some scrap paper for workings out. First they will need to do some research about their chosen creature. Find out its length and height and make a note of it so they can use it later in the task. Now the real math bit starts! This will depend on whether you have 1 inch or 1 centimetre squares and how big you want the drawings to be. For younger children 1 to 1 might be easier for them to achieve but older kids can chose the scale that will suit their paper and their dinosaur. For instance, using 1in squares if their dinosaur was 30 metres long, each square could represent 2m. making their drawing 15 squares long. If their paper isn't big enough for that make 1 square equal 5m thus drawing a dino 6 squares long. They have to repeat this with the height, using the same scale as the length and then draw the shape within those parameters. Sound easy? Give it a try! Makes a great display with all the dinos cut out and mounted on a dino themed landscape! Give the children a list of dinosaurs with their estimated lengths. eg Hypsilophodon 2m. Tyrannosaurus 12m. Ask them to draw a chart on 2cm squared paper. They write the names of the dinosaurs [starting with the smallest ] down the left hand side and the numbers 1 to 30 [or more if they are including Diplodocus!] along the top of the page. Then using 1 square for 1 metre, they colour in the appropriate number of squares. Or as an alternative, they could draw the shape of each dinosaur. This would make a great wall chart and enable the kids to see the vast difference in size of these creatures. Make up some stories with problems to solve. Here are some to start you off! Then the kids could make some up for their friends to solve. 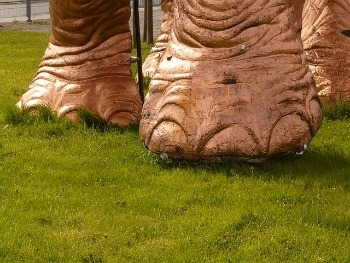 Tyrannosaurus laid --- eggs. 4 of them hatched. How many didn't? 5 Dinos had a race. The winner took only 15 seconds to reach the winning line. The last one was 4 seconds slower. How long did he take? One baby dino weighed ------ kgs and her brother weighed three times as much. How many kgs did the brother weigh? 4 dinosaurs went for a walk. The first liked eating leaves, the second one was big and slow, the third one had big sharp teeth and the forth one had a very small head. Which one do you think was the carnivore and why? 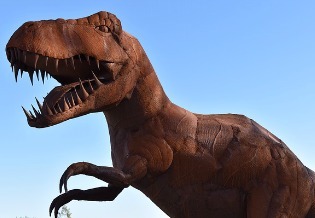 Find out the length of the longest dinosaur ever and measure it out in the playground. 'Wow! That big!' they will say. Put all ingredients into a saucepan and cook gently until it thickens. When cool enough to touch put plastic dino in centre and wrap around to form an egg shape.Allow to dry and then crack open when ready. This can also be done using playdoh and by mixing in some used coffee grounds or sawdust for authenticity! Yes, make your own dino feet out of tissue boxes! Paint or collage your tissue boxes in dino colours then just slip your feet into the hole at the top and there you go! A big roar would be good! This activity is best using clay but Plasticine or playdoh will do if you haven't got clay to hand. 1,Dig out your plastic dinos from the sand tray. Make a flat round shape out of your piece of clay and gently push one of the plastic dinos in so that it makes a indent. Allow to dry and then paint it a fossil colour. This is a good activity to finish your dino theme on because the kids can make one each and keep it as a memento for their dinosaurs for kids theme. 2.Using CLEAN chicken bones, press them gently into a piece of flattened clay [or plaster of paris] remove bone and allow the clay to dry.Paint them a dinosaur colour perhaps green or brown. Again using clean chicken bones, hide them in the sand tray and children can pretend to be archaeologists! 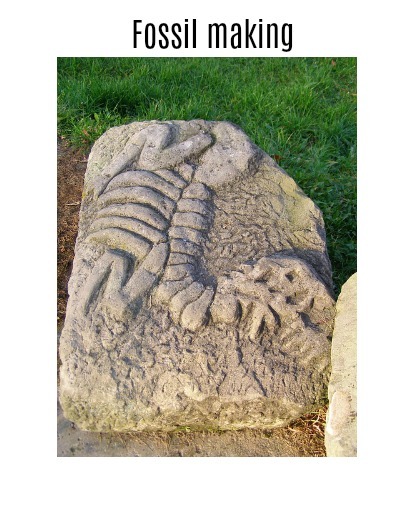 This is a fun activity for budding palaeontologist! All you need is a packet of choc chip cookies, some toothpicks and some budding palaeontologists! Tell the children they are going to find some some fossils in the earth. The earth is the cookie and the fossils are the chocolate chips.They must carefully extract the chips from the cookies without damaging them. Give them a time limit and see who has the most complete fossils in that time. Make dino skeletons out of paper towel rolls. This dinosaur activity is best done in groups. They first draw the dinosaur skeleton shape and then construct it on a large sheet of paper. When they are happy with the lay out they can stick it down.This makes a great display for your dinosaurs for kids theme! This is a great activity for boys [or girls] with plenty of energy! Gently pour warm [not hot] water over the container until the ice block slides out. Head outside and tap the ice with the hammers until the dinosaur break out! Good activity for gross motor control and great fun too! I hope you've found some of the ideas on this page a useful addition to your dinosaurs for kids theme! I would love some feedback on my comments page if you have the time. You never know how well your ideas are received unless someone tells you!! Thank you for visiting my site.